So I was poking around a clients AdWords account (now called Google Ads) and stumbled upon some conversions that Google added to the account automatically. Take a look! What Are Local Conversion Actions? “Since local conversion actions happen on Google’s products and services (for example, Google Maps), local conversion actions are automatically defined by Google Ads.” Like I said, I did not add these conversions to Google Ads, they were added by Google automatically. However, these conversions are not showing in Google Analytics and when I use a third-party reporting tool to pull in Google Ads conversion data, these Local Conversion Actions are not pulled in as conversions. The only ones I can pull in with my third-party reporting tool are conversions that I had created and imported from Google Analytics. So maybe Google’s API does not support this yet? I do have location extensions set up for this Google Ads client with their Google My Business listing. Basically, it looks like Google is importing Google My Business actions into Google Ads. 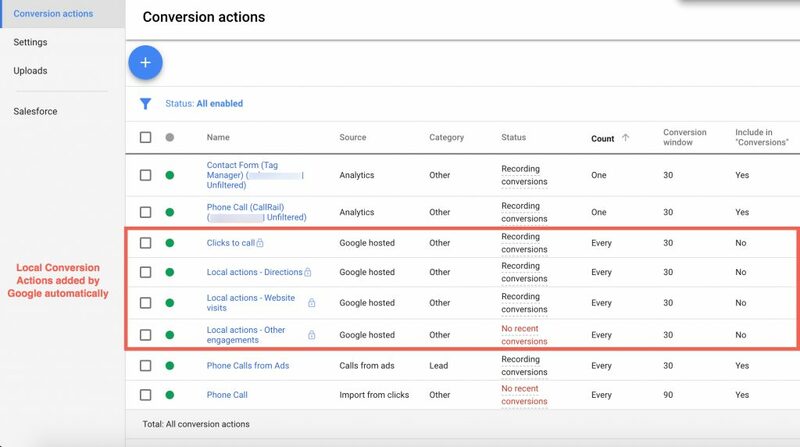 I believe this because I have call extensions enabled as well and the number of click-to-calls from ads is different than the click-to-calls in the Local Conversion Actions. Clicks to call: Clicks on the “Call” button on any Google location-based ad or service after an ad interaction. Local actions – Directions: Clicks on the “Get directions” button on any Google location-based ad or service after an ad interaction. Local actions – Website visits: Clicks on the website link on any Google location-based ad or service after an ad interaction. Local actions – Other engagements: Clicks on other tracked user actions (for example: share location, save, etc.) on any Google location-based ad or service after an ad interaction. Local actions – Orders: (Vertical specific) Clicks on the “Order” button on any Google location-based ad or service after an ad interaction. Local actions – Menu views: (Vertical specific) Clicks on the menu link on any Google location-based ad or service after an ad interaction. Here is some more information from Google on Local Conversion Actions.